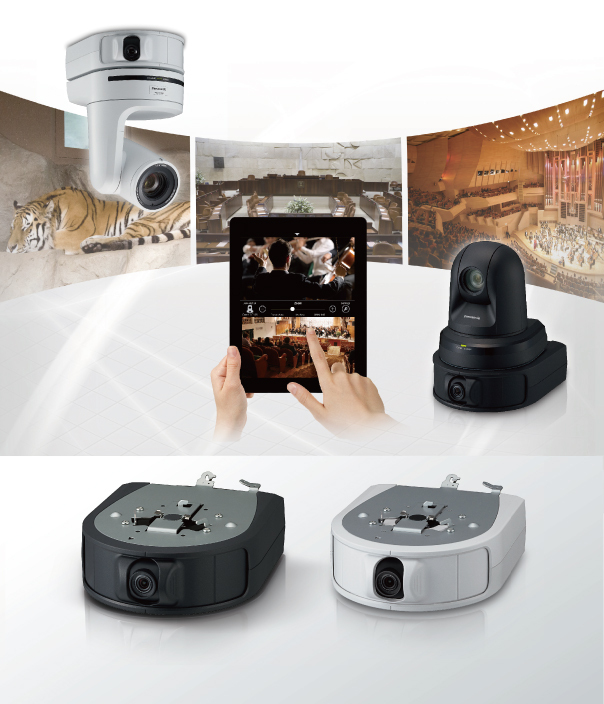 The Control Assist Camera supports flexible and intuitive operation of a HD Integrated Camera*1 by allowing wireless control from an iPad*2. PTZ control is possible with just a single tap on the panoramic view of the scene. Allows up to 100 sets*3 of cameras to be registered in a single iPad and the camera can be switched during the operation. *1: AW-HE130W/K, AW-HE40 Series, and AW-HE60S/H only. When used with the AW-HE60S/H, in some cases an AW-HE60S/H software upgrade will be necessary. For details, see "Support & Download". *2: An iPad is required (sold separately). The "PTZ Cntrl" app for iPad (free download from the App Store) is required. 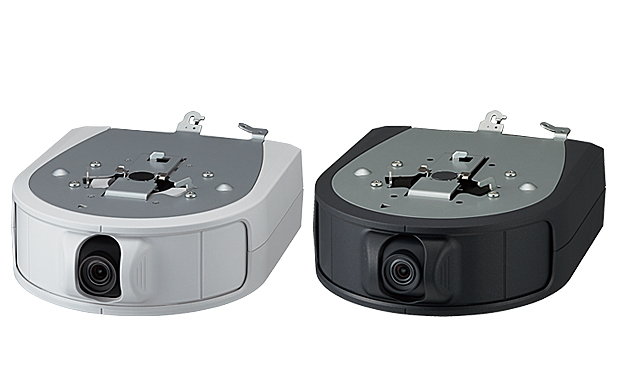 *3: When HD integrated cameras and Control Assist Cameras are combined. A 1/4.37 type (effective size) 3.91 megapixel MOS sensor and a single-focus 95° horizontal ultra wide angle lens enable wide and clear overview shots to assist control of HD Integrated Cameras. 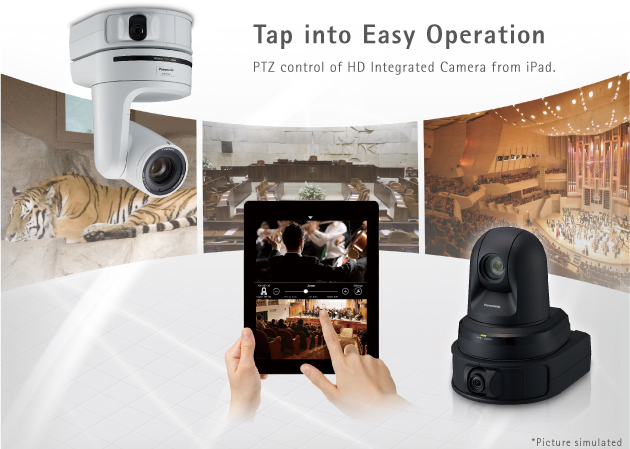 Download the free "PTZ Cntrl" app for iPad and install it to enable wireless control of the camera from the iPad. Operations can be made by touching the screen of the overall image from the Control Assist Camera and an image from an HD Integrated Camera. HD Integrated Camera's pan, tilt, zoom control and camera setting adjustment such as image quality or frame rate can be done from an iPad. Allows up to 100 sets*3 of cameras to be registered in a single iPad and the camera can be switched during the operation. The camera shooting angle can be set in advance with the preset memory function. Tapping and holding the number button saves up to nine setting configurations. Preset can be recalled by just tapping the number. *4: Only functions supported by AW-HE130, HE40, and HE60 can be controlled. Cameras can be set up suspended from the ceiling or standing, depending on the operating environment. The camera angle is manually adjustable with a pan range of ±30° and a tilt range of ±45°. Two color variations are also available: white and black. Select the setup type and color according to the intended application and environment. Connection to network devices supporting PoE (IEEE 802.3af compliant) allows power to be supplied via an Ethernet cable. This eliminates the need for power supply construction and laying power cable, allowing for fewer cords when installing and reduced installation expenses. The HDMI output allows you to use the video captured by the Control Assist Camera by outputting to devices equipped with HDMI. Multiple formats*6 are supported (1080/59.94p, 1080/50p, 1080/59.94i, 1080/50i, 720/59.94p, 720/50p, 480/59.94p, and 576/50p signals). *6: Output to iPad is 640 × 360 or 320 × 180.